Located in the inner Western Suburbs of Brisbane, Milton State School is a medium sized primary school with approximately 600 students. 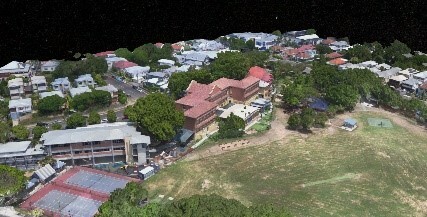 Milton State School is proposing additional facilities to their existing site. Jensen Bowers had already provided a comprehensive survey of the above ground features to the design team. On behalf of the Department of Education & Training, Lambert & Rehbein engaged Jensen Bowers to undertake a comprehensive survey of the school ground and buildings. 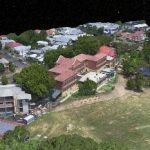 As part of this survey, UAV photogrammetry was utilised to capture areas of the school (e.g. rooftops) not accessible from the ground. The methodology provided an accurate, cost effective model of the roof structures within a safe working environment.